Rekha, a labourer’s daughter, who was forced to leave studies had been for a while resisting intense societal pressure to get married. She wanted to be empowered, but didn’t know how to go about it. The future looked bleak. It was then that she spotted a pamphlet that promised a driver’s job after undergoing a free driving training programme. It’s a heaven-sent opportunity, says Rekha referring to the skill development training programme of National Safai Karamacharis Finance and Development Corporation (NSKFDC). “People tried to demoralise my family when they came to know about my decision to undertake the driver’s training programme. But my father was supportive. Because of him I was able to go ahead,” she says. Her father’s income was meagre and the family of five could barely make the ends meet. That motivated Rekha, a resident of Tigri area in south Delhi, to learn driving and support her family. During three months of training, Rekha not only learned driving but also gained knowledge in motor mechanics. 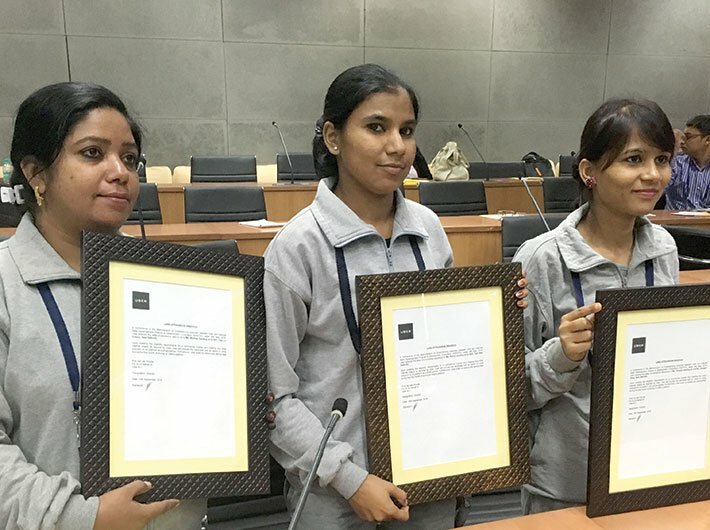 “We were taught basic English as well as self-defence skills,” says Rekha who is now all set to work for Uber, one of the most popular app-based cab services in India. “I am now waiting for my commercial [driving] licence. Once I get it, I can have my own car one day,” says a confident Rekha, who was awarded a Letter of Assurance from Uber at the 9th Global Skill Summit organised by FICCI in September. Uber has signed a memorandum of understanding (MoU) with the National Skill Development Corporation (NSDC) of the ministry of skill development and entrepreneurship (MSDE) and Maruti Suzuki, and launched a project called – UberSHAAN. It helps people like Rekha get employment. It also supports prime minister Narendra Modi’s Skill India mission. “Through this project, our plan is to rapidly scale up India’s entrepreneurial base and generate one million livelihood opportunities on the Uber platform by 2018,” says Amit Jain, president, Uber India. Randhir Singh Kalsi, executive director, Maruti Suzuki, expects to train 30,000 drivers under this programme. The drivers will benefit from learning crucial aspects related to safe and responsible driving and also earn livelihood. Both the executives see this as a venture to create more economic opportunities for government’s Skill India and entrepreneurship building initiatives. Launched on July 15, 2015, the Skill India initiative is trying to create large-scale employment opportunities in sectors like telecommunication, retail, real estate and financial services. Skill development institutes are being run in participation with private players across the states, which are offering courses in 40 sectors like automobiles, gems and jewellery, retailing, hospitality, housekeeping, food and beverages, carpentry, agriculture, driving, manufacturing and many others. These courses are aligned to the standards recognised by the industry and the government under the national skill qualification framework. Uber, which is aiming to dominate the Indian market, is all set to tap the potential of the unskilled Indian workforce. The new project UberSHAAN would give access to skill development and driver training to the unskilled, help trained drivers receive commercial licences and support the entrepreneurial ambitions of licensed drivers through vehicle financing and leasing solutions. As part of the MoU signed with Maruti Suzuki, the two will conduct a four-month pilot project in Delhi/NCR, Hyderabad and Chennai, and organise driver training and on-boarding programmes, which is required to join the Uber platform. On completion of training and receipt of a commercial licence, the company would support the journey of successful candidates by offering vehicle financing and leasing solutions. Based on learning from the pilot project, the partnership would be expanded to other cities across India. Through its partnership with NSDC, it would set up Uber partner support centres in driver training centres affiliated to the Automotive Sector Development Council (ASDC) under NSDC. These centres would facilitate vehicle leasing, financing and digital skills for trained and certified drivers. According to Rajiv Pratap Rudy, union minister of state for skill development and entrepreneurship, it is a linkage towards creating entrepreneurship opportunities. “The prime minister has laid a strong emphasis on entrepreneurship and the role of technology in reaching out to the last mile. We can mobilise the untapped potential of millions of Indians and support them in their journey towards self-reliance,” he was quoted as saying in a press release by Uber. MSDE was formed on November 9, 2014, and tasked with coordinating and harmonising this fragmented approach to skilling. Under its purview is National Skill Development Agency (NSDA) which looks after quality assurance and labour market information system. Also, NSDC handles industry linkage and private sector training capacity and sector skill councils (SSCs) for assessment and certification. Each state has its specific state skill development mission to develop state skill policy, coordinate training programmes and mobilise financing. Currently, the availability of desired skill sets to meet future job demands is a focus area for the industry and the government. What is peculiar to this situation is that only 4.69 percent of India’s workforce is formally trained. But a significant proportion of the existing workforce possesses skills acquired through experience or informally. They are skilled but uncertified, failing to fulfill the industry standards. According to a KPMG report, with a higher GDP and low aggregate employment elasticity, the ability of the economy as a whole to absorb labour has been a challenge. Hence, government measures to boost employment generation are a key driver in the overall growth. All these councils are working in a direction to create skilled manpower, required to provide impetus for growth and sustainability. In the first year of Skill India, 1.04 crore workforce was trained through several central government programmes and NSDC associated training partners in the private sector. The flagship scheme, Pradhan Mantri Kaushal Vikas Yojana (PMKVY), alone skilled more than 20 lakh people.